Although Nick Fury won't be in Avengers: Infinity War or Avengers 4, he will be in Captain Marvel when it arrives next year. But he won't be exactly the same as we've come to know him. Samuel L. Jackson opened up a little about the upcoming Marvel flick starring Brie Larson to The A.V. Club, and he revealed a significant detail. We already knew Captain Marvel will be set in the '90s, prior to when we first met Fury in 2008's Iron Man. So that means we'll be seeing a younger version of Jackson's character. "I meet Captain Marvel in more of an origin story," he said. "You'll see Nick Fury with another guy's face, somebody that's got two eyes, so that's a whole big deal. You'll see. It's prior to the eye injury, no eyepatch." In the comics, Fury loses his eye in a couple different ways. The original character that debuted in 1963 was part of the Howling Commandos and fought alongside the likes of Captain America and Bucky Barnes in World War II. A grenade blast caused him to gradually lose the vision in his left eye. In the Ultimate Marvel universe, Fury lost his eye completely during the Gulf War. 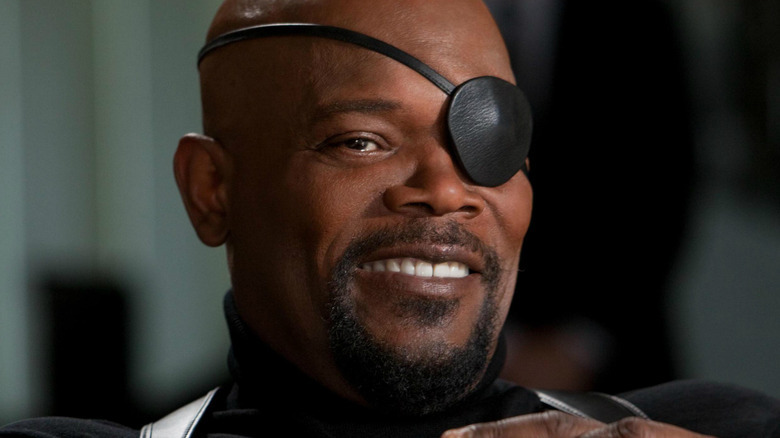 However, we still don't know how the MCU's Nick Fury came to wear the eyepatch. In 2014's Captain America: Winter Soldier, Fury says, "Last time I trusted someone I lost an eye." All we know for sure is that it's probably been decades since Fury trusted anyone. Maybe we'll get an answer in Captain Marvel, which co-stars Jude Law, Ben Mendelsohn (Rogue One: A Star Wars Story), and DeWanda Wise (She's Gotta Have It). But we won't find out until the movie lands in theaters on March 6, 2019.